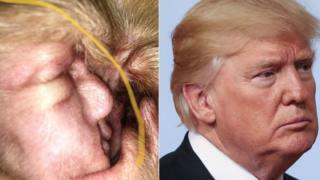 The dog's owner is trying to raise A cyst found in a dog's ear looks like Donald Trump's face and blonde quiff, its owner claims. Jade Robinson, 25, of Jarrow, Tyneside had to wait until her two-year-old beagle Chief was asleep before snapping the inner ear to send to a vet.But it was a friend who spotted the resemblance between the 45th president of the USA and the infection. Ms Robinson is now trying to raise money to have Chief sedated so the vet can properly examine his ear. She said: "If you know anything about beagles you know how intelligent, active and curious they are and Chief certainly lives up to that - he's full of mischief. "As he has the very distinctive long ears they spend a lot of time scraping the ground sniffing for lovely smells, unfortunately this leads to his ears picking up a lot of dirt. "We have fought to keep his ears clean since day one however general cleaning can only go so far. "This photo had to be taken whilst Chief was asleep as he does not like his inner ears to be touched and I swear I looked and zoomed in and out at this photo over 20 times and never saw Donald Trump - it was my eagle-eyed friend who pointed it out." So far Ms Robinson's fundraising page has raised ?38 of her ?430 target. » When will Donald Trump officially become President of the United States?